IMPORTANT NOTICE II: This is a COY+ sized engagement, and we again have the pleasure of having a contingent from United Operations joining us: they will be manning Bravo COY. Thus there are only manning open for Alpha COY. Peace creating forces from the Coalition have subdued the Island of Kavgos, with very few casualties on the side of the Peace Creating Forces. It was hoped that this would be enough to create stability and allow the coalition to withdraw without further bloodshed. This naturally were a political illusion, much in the way of many of the previous peace keeping and peace creating efforts of the 20th and 21st century, both in and outside of UN resolutions. In fact while very successful, then in this case it did not create the political change that happened after Argentina soundly lost the Falklands war. The politicians somehow forgot that Turkey was economically and politically much stronger. And that Turkey in fact was backed by Russia among others. And also that their armed forces of the Peace Creating Coalition were stretched beyond thin, after years of neglect and cost savings. And above all that they did not project the political Iron will, resolve and strength, that Margaret Thatcher did. Thus the Turkish and Russian analysis was that this was a feeble swing in the air, made by a mostly impotent and weak giant, a one-off where they got lucky. Despite the tragic and sizeable losses, then from a cynical and practical standpoint the Turkish losses were limited. In following that chain of thought the Turkish and Russian came to the conclusion that the best way of tackling and challenging the weak political leadership of the west, was to go on the offensive. Specifically then Turkey have brought up their readiness across the board. And more importantly invaded another and much bigger Island in the Aegean as a direct challenge to the coalition. NATO, EU and the UN for whatever worth the latter is, have tried desperately to contain and deescalate the situation without any real progress. And yet the parties were close to at least meet in the same room - that is until SAS flight SK 3179 was shot down in the Aegean. It is hard to find out why or exactly how it happened, but what is know is that it was shot down by Turkish and possibly Russian manned Surface-to-air missiles. The airplane had tried to use a flight route that took it outside the contested areas, but the fact is that European airways are congested, so it was at its outer limit of the flightpath. The turkish government claims that it had "the characteristics and vector" of a hostile plane, which international experts have contested. In a most unlucky turn of events, then the plane held passengers of all the nationalities that were involved in the actions in the Aegean. This has helped stiffen the resolve of the politicians in the coalition countries. Mostly because rather large numbers of their voters are screaming for retribution. In a political wording then "while we keep all options on the table, then the environment and context makes a political settlement in the present climate very challenging". So while the politicians still try to talk, the military is getting ready to act. It is the hope that freeing this island and inflicting another heavy blow, will force Turkey and by extension Russia to the conference table for a peaceful solution to the overall conflict. In the meantime the Turkish Land Forces have expelled all the Greek inhabitants of the Island, which simplifies our military mission, while it makes the political solution even harder. The remnants of Taskforce Saber have been reintegrated and replenished and partially joined with another group to create the Swedish COY GP Broadsword. The Peace Creation Coalition have landed several combined combat teams with tanks and infantry, supported by UAVs, and direct-support artillery, including COY GP Broadswoard. Meanwhile, other units are offshore with 6th Fleet, preparing for additional landings in other parts of the island against the Turkish Land Forces elsewhere on the island. We have local air superiority, but having lost a helicopter from direct fire in the last operation, are limited to strike planes. 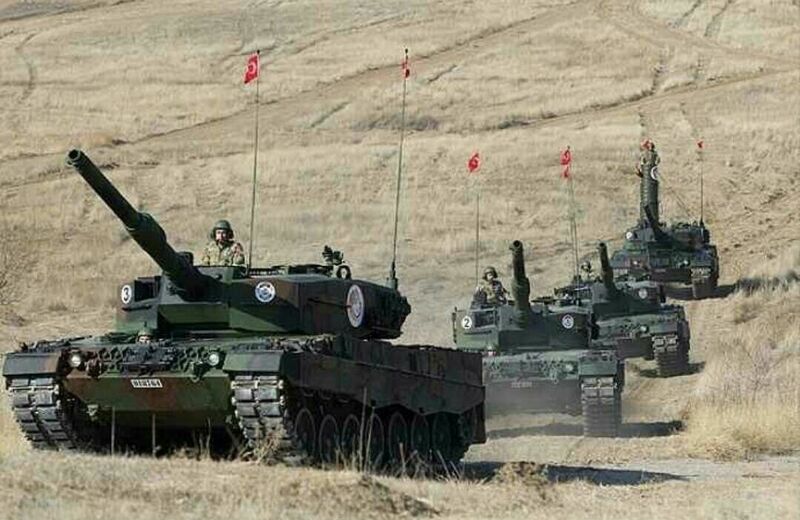 Turkish Land Forces have roughly a Battalion (-) of combat power defending the area, with at least two tank companies (Leopard 2A4) and one company of mixed mechanized and motorized infantry (Turkish IFV´s are represented with Ulans and Turkish Recon vehicles with VEC-M1´s). These are augmented with dismounted ENY infantry, that are expected to have access to MILANs that are locally produced under licence by ROCKETSAN and M72A4´s that are produced under licence by MKEK, as well as BGM-71 TOWs. As the ENY have had little time to prepare, then we do not expect major Obstacles or minefields, but confidence about that is medium to low. However given the previous encounter then we do expect them to be entrenched and in a combat stance. We have US and Italian forces to our EAST and WEST that will push forward and support our attack. 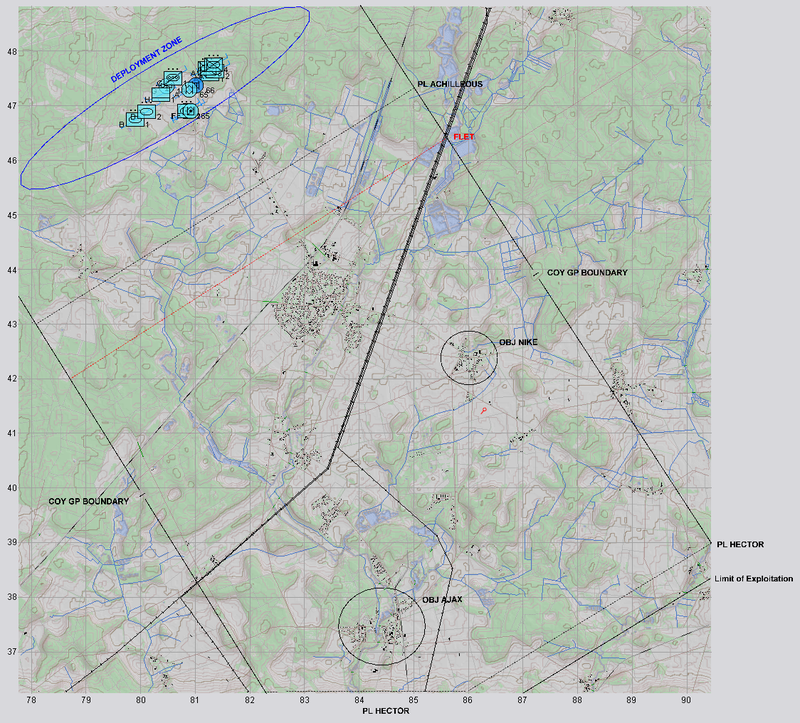 So do NOT cross the COY GP boundaries reference Map trace, to avoid risk of Friendly Fire - this includes the UAV. Our COY GP consists of 4x tank platoons as well as 2x mechanized infantry platoon, along with a PLT of Centauros in tactical reserve. 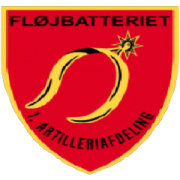 This consists of a Swedish Company of 2 x PLT of STRV 122 and 2 PLT of CV9040-B, reinforced by 2 x PLT STRV 122 from another COY. Added to this is an Italian reserve of 1 PLT Centauros. We have also been augmented with a UAV from Golf Company, 3 x 6 tubes of 155mm howitzers and 6 x 120 mm mortars from Fox Company with its own supply truck (with the howitzers being further back, so off-map), as well as support assets from Hotel Company (repair/rearm, and medical). Our dismount infantry is equipped with light machine guns (FN MAGs) and Anti-Tank teams ( 2 x Spike & 2 x CG). Each platoon thus has 4x LMG teams and 4x Anti-Tank teams plus a medicteam. 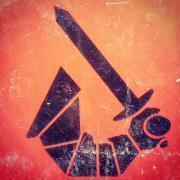 D. We are de Facto at war. Destruction of civilian property has been cleared by the Greek authorities if CO deems that there is a military value and goal in said destruction, including FIRES in urban areas. COY GP Broadsword attacks to destroy Turkish defenders between PL ACHILLEUS and PL HECTOR to expand the NATO beach head and allow friendly forces to continue offensive operations across the island. Alpha Company reinforced by 2 PLTs from Bravo Company and 1 PLT from the Italian contingent, will continue to expand the beachhead and clear Turkish armor and mechanized infantry from OBJ NIKE and OBJ AJAX; this will create a sizeable security area surrounding the beach head and enable the the Brigade Combat Team to continue to generate combat power. COY GP Broadswoard will attack from the North and towards SOUTHEAST, setting an attack by fire from PL ACHILLEOUS, and use own assets to clear OBJ NIKE and AJAX. Purpose - The purpose of this operation is to clear the Turkish and defeat their will to fight on this island. Friendly Friendly forces postured on PL HECTOR; consolidated and prepared to continue operations towards the International Airport to the South East. Enemy Enemy forces defeated or destroyed between PL ACHILLEUS and HECTOR; unable to continue supporting Turkish defenses on the Island. Terrain OBJ NIKE and OBJ AJAX are cleared of enemy forces. Fox Company has 3 x 6 Tubes of self-propelled 155 mm howitzers that will directly support this operations, from outside of the AO (off-map). Additionally they have allocated Six 120 mm M1064 for use, with integral ammo supply truck. And finally 6th fleet will provide 8 CAS strikes. Battalion has been given direct support from 1 x UAV (G-1). Supply COY GP will carry forward 2 x resupply vehicles, F-1have 1 x supply vehicle allocated to them. No resupply possible beyond that . but I'll be streaming the event on Sunday starting 1900z. So if you cannot attend or some how hindered or something comes up, don't worry! You can jump on my twitch to see and join the dicussion and I'll post the VOD (Video of Demand) after the stream is over here or in the video tab in Steelbeats. Hope to see you in the event, or to chat with you on the stream! Another week before I will be available. The mission sounds good enjoy all the best. Whould you kindly put me in A32. My new, hopefully short term, night shifts may now extend into next week. I maybe around for this on my Monday morning. So a tentative "might be there" and a "where required" if I am. You could get in A-13 and you would not be required to listen to other than the platoon net. That would keep you off any net the UO component may be recording (I believe they are also blue but on a different company net than we will use). If not that, you could always be my gunner again. For this one there will only be Alpha Coy Net reinforced with 2 PLTs from Bravo so all on 1 command net. But Cavgunners solution fixes that.